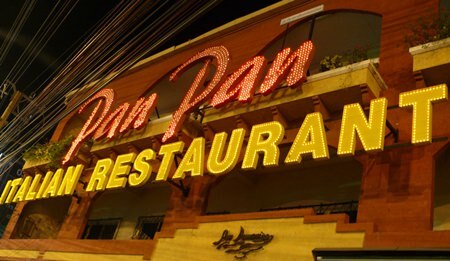 There are some restaurants that stand the test of time, and the original Pan Pan in Jomtien is undoubtedly one of those. Located very close to the T-junction between Thappraya and Thepprasit Roads, it has been a very popular restaurant in Jomtien for many years. 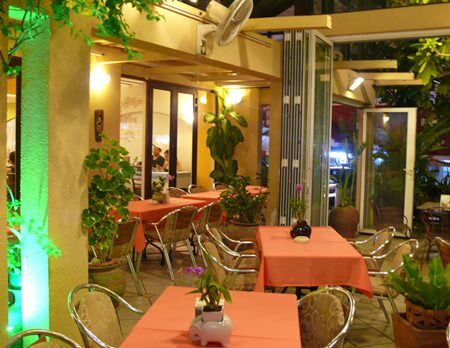 Its popularity is not just in the Pattaya diners, it is visited by scores of people from Bangkok every weekend, and has remained one of the most successful Italian restaurants in Pattaya. The ambience is Italian, with the words San Domenico under the name Pan Pan, making one remember the Basilica of San Domenico, one of the major churches in Bologna, Italy. Walking in to the restaurant, you are immediately struck by the European ambience. The salmon pink walls and the salmon pink tablecloths, the terracotta tiled floor, the draped windows – it all fits, and is a tribute in many ways to the late Nic Demet who carried out the refurbishment. The tables are set so that you can have an intimate dinner for two, or a board meeting with 20 quite easily. Dotted throughout the restaurant are plant pots. There are also other dining areas, including an al fresco section at the rear of the building and some outside tables at the front. The coffee corner has its own area complete with refrigerated cabinet with pastries and ice cream with classic cappuccino and caffe’ espresso, the caffe mocha, the macchiato, milk, Irish coffee and more. The choice is yours, and there are plenty of them. It is more of a trattoria style than upmarket restaurant. The menu is familiar (if it ain’t broke – don’t fix it, comes to mind). The prices only show a very mild increase over the years. It begins with Appetizers (B. 100-550) with Bruschetta with tomato and garlic at the lower end and Parma ham and melon (large serving) at the top end served with pizza bread. Salads next (B. 180-310) with the salmon with glass lettuce, onions, eggs and olives sounding very conducive towards a great salad. We also noted the Insalata caprese, another classic Italian course: tomato and mozzarella cheese, oregano, basil and olive oil. Soups and Pastas are the next section (B. 150-380) with traditional Minestrone at the lower end and a Spaghetti alla Tarantina with prawns, clams and mussels at the top end. Main courses (B. 300-450) show that this is not an expensive restaurant. This section includes tenderloin and Scaloppine. There are also weekly specials (B. 320-400) which on our evening included Red Snapper. Pizzas (B. 220-420) have their own section (naturally, this is an Italian restaurant after all). The traditional Margherita is first and the very interesting four cheese pizza (mozzarella, gorgonzola, camembert and fontina) at the top. 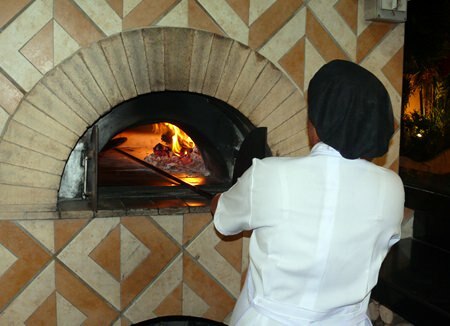 The pizzas are made in a traditional oven at the front of the restaurant, and you can watch yours being made by the skilled cook in front of your eyes. Of course there are breads and cheeses as well, including Gorgonzola and Parmigiano. Wines are all reasonably priced, with many very drinkable wines around B. 1,000. 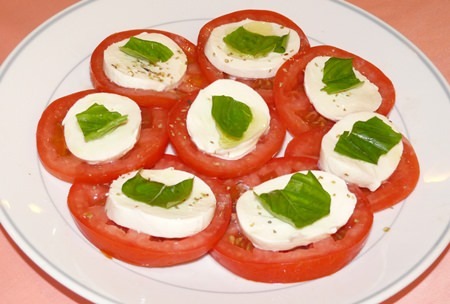 We began with the Insalata caprese, sliced tomato with mozzarella cheese, oregano, basil and olive oil. 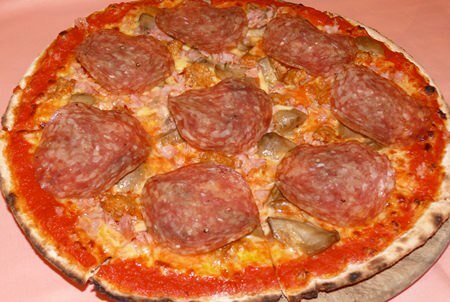 That was followed by a Montanara pizza, a refinement in pizza making which has been done in Naples for many years, but only recently has ventured outside Italy. The wheel of dough is fried quickly, then the other ingredients (tomato, mozzarella, mushrooms and Italian sausage) added and sent to the pizza oven to bake. Summing up, Pan Pan reminds me of a comfortable pair of old shoes. Not squeaky new, but can be relied upon to give good service in a warm friendly way. Even the rustic wicker chairs are welcoming. If you are looking for an Italian venue, you can add Pan Pan to your list. Even though Italian cuisine can sometimes be on the heavy side, there are plenty of light meal choices on the menu. Pan Pan, Thappraya Road (just up from the Thepprasit T junction), telephone 038 251 874. With the popularity of this restaurant it is probably best to book in the evenings. Secure parking outside and at the rear of the building. Open every day 10.30 a.m. until late.